Since the launch of Skype 5.2 for Windows, the Dial Pad features have been enhanced significantly to point where it actually has some intelligence to make it easier to place a call to the PSTN. Skype 5.5 for Windows gold release also restores the dial pad as an option during Skype-to-Skype calls; this option had been dropped in the 5.5 beta release. But you may ask why would one need a dial pad for a Skype-to-Skype calls? 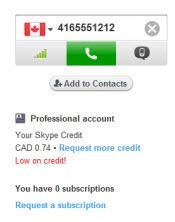 Turns out that there is a Skype for Business offering that requires access to the dial pad during what is really a Skype-to-Skype call to a business using this offering. Over at the Skype Reference Guide I have added a page that describes all the features and benefits of the Dial Pad in Skype for Windows 5.2 and later. Find out why, when you click on the “Call Phones” button, you may end up with no numeric dial pad; learn about the only situation where you may need a dial pad during a Skype-to-Skype call and the minimal dial pad feature in Skype for Mac 5.x. Learn about Text-Tone dialling and how that simplifies making a call to a Contact’s PSTN number.